We sell a wide range of Calcite pieces, both rough and polished. See below for our categories, and scroll further down for information about the stone. This includes mineralogical information and some about crystal healing, too. Calcite is a very common mineral which is found worldwide and comprises around 4% of the worlds crust. It can be found in sedimentary, igneous, and metamorphic rocks. This mineral is the primary constituent of the shells of marine organisms, and we find many fossils where it has replaced other minerals or organic materials. We consider it the perfect start to a mineral collection, as it is a cheap mineral with many interesting colours. The fact it looks interesting both polished and rough is handy, too! This mineral consists of CaCO3, otherwise known as Calcium Carbonate. Calcite is primarily used in the building trade and construction industry. Typically, it is powdered, but in some cases rough blocks are used for aggregate, etc. It can be used as an ingredient for cements and mortars and the production of lime. Another common use is a bulker for paints and plastics, adhesives, and fillers. Calcium Carbonate is used to purify iron from Iron ore in a blast furnace. Some pieces of the mineral have optical properties; they have been considered for use in invisibility shielding. These pieces were originally found in Iceland, but as a result of over mining, the majority of the pieces now come from Mexico. When powdered, potters can use it as an ingredient for many glazes, and it may be used as a flux. It is, of course, also sold as mineral specimens, and commonly used for cutting and polishing. In some cases it is used for jewellery but this is not common as the stone is too soft for most jewellery. The name originates from the German ‘Calcit’, which comes from the Latin ‘Calx’, meaning Lime. Some websites also state that the name comes from the Greek ‘Chalx’ or ‘Chalix’, again meaning Lime. Ancient Egyptians carved many pieces from this stone, mostly the goddess Bast. Perfume jars carved from this stone were found in the tomb of Tutankhamen. Many other ancient cultures also used it for carving, due to the soft nature of the stone. There is decent evidence that optical quality pieces of this stone were polished and used by the Vikings. There are references to a “Sunstone” in ancient sagas, and it seems like this could have been it, given its availability in Iceland at the time. That means the stone may have been responsible for the discovery of America and the attacks on England and the rest of Europe! The optical pieces were treasured by scientists for hundreds of years, including Isaac Newton. These studies helped to contribute to the wave and particle theories of light. Over time, the polarisation of light came to be understood, and pieces of the mineral were used to discover all sorts of things, including the invention of special prisms and polarimeters. In the late 1800s there was a shortage of the stone, which was a problem for most developed nations because so many scientific tools relied on it! 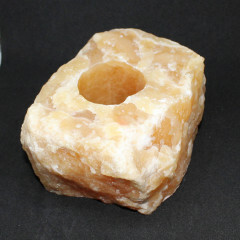 Optical calcite was used in World War 2 for small, accurate gunsights, and because of this it was considered by the American government as a strategic resource. Some archaeologists and stone work top sellers may refer to this stone as Alabaster. In a mineralogical sense, this is incorrect; true Alabaster is a variety of Gypsum. Calcite occurs around the world. There are too many to list, but some of the most important locales include Mexico, the United States, Romania, Slovakia, Africa, England, Germany, and Iceland. Calcite has a fairly low hardness on the Mohs scale – 3. It has a white streak on ceramic plates. Due to this, you should make sure to use dark testing plates. It is highly reactive with acids, even weak ones such as vinegar. This is an easy way to test the stone, as it should fizz in contact with vinegar. It exhibits rhombohedral cleavage in many of its varieties. It can be either transparent or translucent. Calcite can appear to be quite waxy in its rough state. It has a specific gravity of 2.71. Some Calcite pieces display an optical property called birefringence, which is double refraction. This effect is very interesting in ‘Iceland Spar’ as it can be demonstrated clearly. Essentially, a beam of light entering the stone will split in two. As such, a person looking into the stone will see two of everything on the other side. The best way to view this effect is to place the stone on a page of a book, over some text; or over a straight line drawn on a page. Many cave formations are formed of dissolved Calcite slowly dripping through the ceilings of caves and chambers – this is how we get Stalactites and Stalagmites, as well as many other forms of unusual formations. Some people of Calcite do fluoresce, but not all. Some of the Mexican and American pieces do show a decent fluorescence. The mineral can be dissolved by most acids, but may also be dissolved by water. As such, we can’t recommend placing or leaving pieces anywhere they may get wet – including rain, humidity, or in fishtanks, aquariums, etc. A financial hazard! Many less scrupulous sellers refer to a form of Mexican or Pakistani banded Calcite as ‘travertine’, ‘Onyx’, or any number of other names. It is not! This stone occurs in a fair few varieties and colours. Common colours include white, yellow, red, orange, blue, green, brown, grey and more. Some pieces are acid treated to enhance their colours. It is a polymorth with Aragonite and Vaterite. This means that the minerals all have the same chemistry, but different crystal structures and formations. They have formed differently – different shapes, etc. The surrounding rock and temperature will have had an effect, as will many other things. Banded Calcite, Cobaltoan Calcite, Cobaltocalcite, Dogtooth Calcite, Mangano Calcite, Optical Calcite. Alabaster, Calc Spar, Dog-tooth Spar, Flowstones, Hog-Toothed Spar, Iceland Spar, Manganocalcite, Manganoan Calcite, Mexican Onyx, Nailhead Spar, Onyx. This mineral is sometimes dipped in acid, which melts away the sharp pieces and rough edges of the stone. This may also improve the colour of the pieces. By removing the external layer, it polishes and rounds the stone off to some extent, which will help to show off the colour too. This gives the surface of the piece a waxy sort of appearance and feeling – rough pieces will be almost ‘chalky’. In some cases, Calcite is dyed to enhance the colours. We do not buy or sell dyed pieces. Many corals and other sea creatures actually make their shells out of CaCO3, by pulling Carbon Dioxide from the seawater. As this removes CO2 from the sea water, it allows more to be drawn from the atmosphere, and may have been a factor for the development of our planet and our atmosphere. 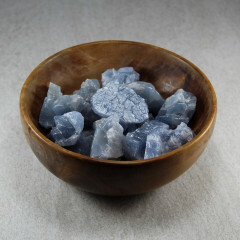 This mineral is widely used for healing, however, people tend to separate its healing properties by colour, as there are so many variants and colours. I’ve listed a few of the more common types below. The gentle blue colour of this stone is thought to help you recover from illness, or relax. 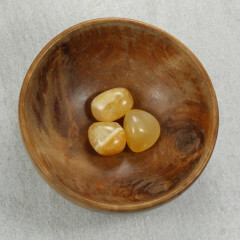 It is a soothing stone, and may help to relieve panic attacks and anxiety. It is also thought to relieve unwanted and negative emotions, helping you to have a calm state of mind. This lovely soothing green stone is thought to help with mental healing, especially removing old conditioning and ways of thinking. It may help you to find new ways to see the world, and remove old ones that may be restricting you. It is also thought to help with removing negativity and bacterial infections. You should be careful to cleanse this stone after every use, as it may absorb negative energy. This lovely orangey-red stone is an excellent tool for meditation. It can help to stimulate mental activity and help with mental awareness. It is meant to be helpful for making you rethink your personal beliefs, and help remove any mental limits you have set. A stone of forgiveness and understanding, that may help to release any fear and grief you are holding on to. It is also a very calming stone, and may help with nerves, panic attacks, and anxiety. Some people believe it helps to prevent nightmares, too. It is a good stone for people who suffer from anxiety attacks. These lovely bright pieces are thought to be the perfect stone for meditation and mental alertness. It is a highly energetic stone, and can help you to balance your emotions. This strong red stone helps you to increase your energy, and removes stagnant energy. It is also said to help clear mental blockages, which may be giving you difficulty choosing your path through life. We do not recommend making ‘gemstone elixirs’ in general – whether you’re using a gemstone, mineral, crystal, or glass. If you do choose to make elixirs we would recommend an indirect method. As mentioned in the information above, this mineral can dissolve in water. It isn’t likely to happen, but why risk it? Calcite elixirs are thought to help with feelings of being trapped emotionally. They may also help with a lack of ability to plan for the future. Typically, this stone is associated with the Zodiac sign ‘Cancer’. Calcite is typically combined with its own other types and colours. You may also wish to combine each coloured variety with a stone of the same colour – blue Calcite with Angelite or Celestite, for example. ResearchGate – an interesting paper on Iceland Spar by Leo Kristjansson.